Riots and revolts spread across Judea. Twelve-year-old Yeshua is in Jerusalem-"about his Father's business" in the Temple-as his panic-stricken parents search for him amidst the chaos. Readers will enjoy reading this interesting story from Christ's youth. This is the ninth book in the A.D. Chronicles series. Includes historical maps and a discussion guide for individual or group study. - Publisher It is a time of great danger and suffering... yet the candle of hope still gleams.The census riots are barely past. Bands of Zealots roam the canyons. Anguished shrieks echo against the hillsides of Nazareth as Rome crushes the last pockets of Jewish resistance. Herod the Butcher King is dead, but his cruel son, Antipas, now reigns in the Galil. Nine-year-old Jude and six-year-old Kerah watch as their father, Judah the Zealot, the hero of the Galil, hangs on a Roman cross. His dying whisper to Jude? "Take your sister to Jerusalem." But the journey is long and dangerous ... especially for two small children and an old woman.Zachariah, Elisheba, and young Yochanan watch the compelling signs in the heavens and ponder what they mean. Could a day of justice be coming for the Jews?Aged scholar Rabbi Mazzar travels with his three Yeshiva students to Jerusalem for Passover and their bar mitzvahs. 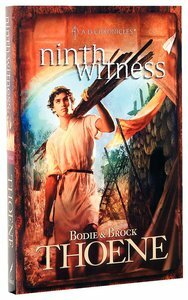 He has high hopes for twelve-year-old Yeshua, who seems to study people as well as Torah. Could such a one make a great rabbi? Or be the founder of something even more enduring?Special feature: Study questions suitable for individual use or group discussion. About "Ninth Witness (#9 in A.d. Chronicles Series)"
It is a time of great danger and suffering... yet the candle of hope still gleams.The census riots are barely past. Bands of Zealots roam the canyons. Anguished shrieks echo against the hillsides of Nazareth as Rome crushes the last pockets of Jewish resistance. Herod the Butcher King is dead, but his cruel son, Antipas, now reigns in the Galil. Nine-year-old Jude and six-year-old Kerah watch as their father, Judah the Zealot, the hero of the Galil, hangs on a Roman cross. His dying whisper to Jude? "Take your sister to Jerusalem." But the journey is long and dangerous ... especially for two small children and an old woman.Zachariah, Elisheba, and young Yochanan watch the compelling signs in the heavens and ponder what they mean. Could a day of justice be coming for the Jews?Aged scholar Rabbi Mazzar travels with his three Yeshiva students to Jerusalem for Passover and their bar mitzvahs. He has high hopes for twelve-year-old Yeshua, who seems to study people as well as Torah. Could such a one make a great rabbi? Or be the founder of something even more enduring?Special feature: Study questions suitable for individual use or group discussion.